Jart is male, 15-1/2 years old and an All American (likely Papillon/Mini Aussie or Sheltie mix). How did you end up adopting him? I was looking for a new agility dog, small dog, to add to my family. A friend had rescued a dog and he was a special boy and was looking for just the right home for him since he had already gone from a shelter to a home with family and kids who scared him. He hid under table for three days then they returned him. My friend had him for a year looking for the right home for him before I adopted him. What about the dog made you want to adopt him? Was there something different or special that moved you to the decision? Other than his cuteness, and that he got along with my dogs, particularly my Border Collie Buddy who didn’t get along with too many other dogs, my friends’ confidence that I could give him a supporting family and me knowing I could bring him out of his shell and make him a confident dog. 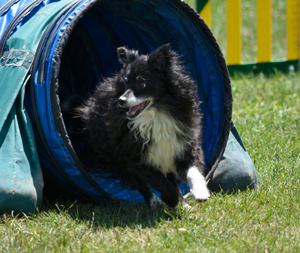 What made you want to get involved in agility with your dog? 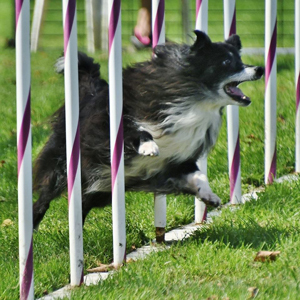 Had you competed in agility before you got your rescued dog involved or was it new to you? 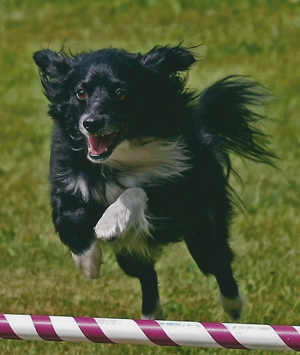 I had already done agility with my previous three dogs, so it was natural to do it with Jart! Did your dog happen to have any behavior or training issues when you adopted her? Oh yes! He was deathly afraid of people (even me at first!). So I often took him to fun matches, run throughs, small trials, all to just hang out with him so he would become more comfortable. He never stopped shaking, and didn’t take treats, but after a year or so started to get a bit better. I started competing with him about two years after I got him, and at first he hid in tunnels, shied away from the people at the gate and the judge. But over time he found the agility ring to be his safe place, and while doing courses he was happy and not scared. By the time he was around 9 or 10 he started going up to strangers, like ring crew and people outside the ring, looking for treats. And now he doesn’t seem to mind strangers at all! Was there anything about training for agility or competing in agility that was a challenge with your dog? The biggest challenge was mostly making sure the judge didn’t scare him when moving in to judge a contact or table, and maintaining my routine coming into the ring to make him feel safe. What previous USDAA events prior to Cynosport 2017 have you competed in with your dog? What titles, etc. did they earn or other accomplishments you’re proud of? We competed in 2015 at Cynosport as a veteran, and in 2013 as a Performance dog in Grand Prix, Steeplechase and PVP team. He has his PDCH, CPE CATE2, TDAA multiple TACH’s. Oh and he now loves Cynosport Rally obedience and has Level 1 and Veteran multiple titles. What are you looking forward to this year with your dog at Cynosport? Jart is semi-retired from USDAA, so anything he does this year is all for fun, we’re just here to enjoy ourselves. Jart has proven himself in the past, and has nothing else to prove at this stage in his career. What would say to people who are considering adopting a dog who might want to do agility some day and are concerned a rescue dog may be more difficult to work with? Likewise, what do you think makes competing with a rescue dog a real benefit? All my six agility dogs have been rescue dogs; all but one have been mixed breeds. All have been a unique challenge, no two dogs are alike! But I have a blast working with each dog’s strengths and weaknesses and helping them to be the best they can be, and for us to be a great team. There is no downside to training and competing with a rescue dog! As to benefits, there is a great sense of accomplishment and feeling that you’ve done a great thing in helping a dog with a history achieve great things and made their lives better.